The Red Arrows are performing a fly-past shortly after the cutting of the ribbon. 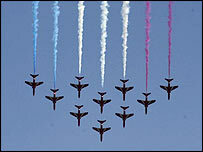 The world famous Red Arrows have marked the official opening of a new dual carriageway. The A46 Lincoln to Newark dualling has been completed ahead of schedule and was given its official opening on Thursday. The new eight-mile dual carriageway, which cost £28m to build, is expected to bring economic benefits to the region. Head of Economics for Lincoln City Council Mike Roberts said: "We're all very excited by it - we think it'll be a major asset for the city of Lincoln and connect us to the main A1 or south route". The new road was opened by Roads Minister David Jamieson. The Red Arrows performined a fly-past shortly after the cutting of the ribbon. Inspector Les Parker from Lincolnshire Police stressed that while the road will undoubtedly reduce the number of accidents, it must not be abused. He said: "The new dual carriageway would seem very inviting to go speeding along - but I'd ask people to respect that road, don't turn it into a racetrack." Consultants are currently drawing up a preferred route for the next stage of the dualling - a £115m scheme between Newark and Widmerpool near the Leicestershire border. A decision on that proposal is expected next spring, with work starting in 2006 and finishing three years later, if approved.